One of my earliest articles centered on the truly excellent white wine from the eastern side of Piedmont made from the resurrected grape Timorasso. Since then, a number of wine experts such as Jancis Robinson and Joseph Bastianich have written in praise of this grape and its wine. Thus I was interested in tasting Timorassos from other wineries. The Timorasso grape is considered native in the eastern part of Piedmont and was a common grape at one time. But it was never considered good enough for commercial products and was almost extinct by 1980. Then, through the dogged persistence of one man, Walter Massa (see my earlier article, A White Wine and Winery Worth Noting), the grape was resurrected. Walter Massa ultimately replaced his Cortese vines in his family vineyard with Timorasso. Today there are over twenty other growers in the Tortonesi hills area producing Timorasso wines. These wines feature great minerality and crisp acidity. Through my wife’s love of dessert wine and some friends in Le Marche, I became friends with Joseph DeFronzo, owner of SMD Selections, an importer of Italian wines and food. When I told him of my interest in Timorasso, he sent me some of his wines, including the Timorassos in his listing. From the winery of Claudio Mariotto Mr. DeFronzo sent two different Timorasso wines, which I tasted with meals — which I believe is the best way to evaluate wine. Azienda Agricola Claudio Mariotto in Tortona grows Dolcetto, Cortese, Barbera and Timorasso grapes on 25 hectares. The Timorasso I received came in two offerings. 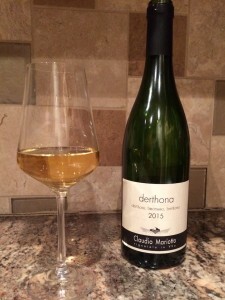 The lightest , a 2015 DOC Derthona, was a 14% alcohol, 100% Timorasso grape wine, straw yellow in color with a fruity nose. It finished medium but very smooth and had a notable light fruit taste. It was an excellent complement to the Melanzana Parmigiana that my wife had made and would go well with seafood or light pasta. I rated this wine an 89/90. Next we tried the 2015 DOC Pitasso, another 100% Timorasso grape offering but with 14.5% alcohol content. The Pitasso was also straw yellow but a more complex fruit nose. Its finish was long and very smooth and I rated this really pleasing offering a 90/91. I believe that this wine would be an excellent accompaniment to any meal except the heaviest beef or cheeses. The third wine from Mariotto was a 2015 DOC Territorio, a 14% alcohol 100% Barbera grape offering. This wine is made from 25 year old vines and had a rich garnet color and a fruit nose. It finished medium and smooth and I rated this wine an 89. I felt that this wine would be much better in 2-3 years. Another wine sent by Mr. DeFronzo was a 2013 DOC Lugana from Azienda Agricola Conati in the Lake Garda region. This wine was a 100% Turbiana grape with a straw yellow color and a fruity nose. Aged in stainless steel at controlled temperatures the Lugana finished medium and smooth. It had a slight fizz when opened but this did not continue after opening. I rated this wine an 88 and recommend it for seafood dishes. I thank Mr. DeFronzo for providing these wines for tasting. I would be remiss if I didn’t mention the dessert wines he imports, especially those from Azienda Agricola SIGI. My wife says these are very good. « Wine prices: How low can you go?